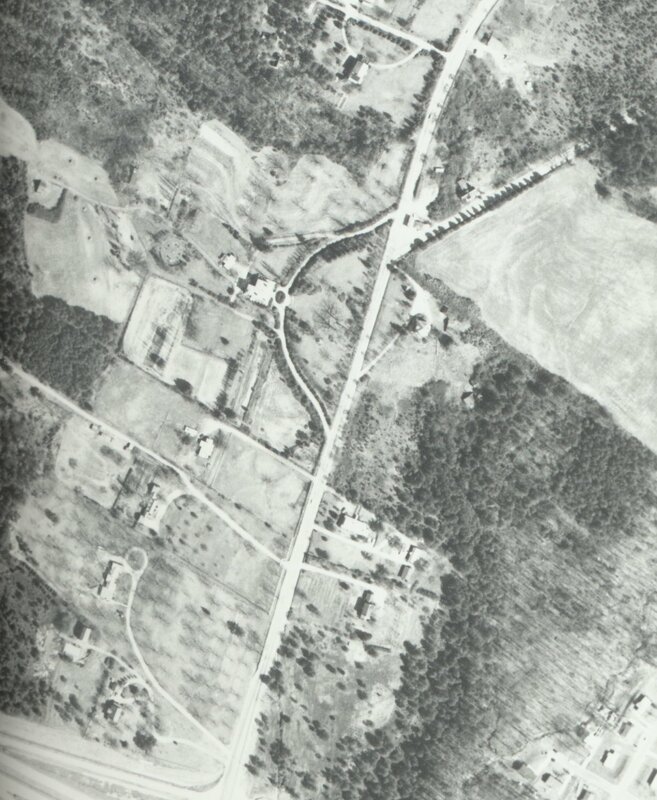 On a whim I looked back at the 1965 aerial photo I got from the North Carolina Geological Survey when I was researching the Raleigh Speedway. It turns out this photograph nicely covers the Wake Forest Road area north of the Beltline! This means it probably shows Isaac Hunter’s Tavern, but the question is where? Looking at this shot you can see many residential-type buildings along the road. At the bottom is the Beltline, still being constructed and at the top of the photo you can see the eastern half of St. Albans Drive branching off. This area roughly corresponds to this modern-day view shown on Google Maps. Now my Navy military-intelligence training did not make me a satellite imagery expert, but looking at this photo and comparing it to the roof of the tavern as shown in the Flickr images it’s pretty easy to rule out many of the buildings shown. Second-story homes cast longer shadows and the tavern is decidedly single-story. There are also homes with much fancier rooflines than the tavern, so those are easily ruled out. What does that leave? I’ve (crudely) highlighted two buildings that seem like good candidates. Building A sits closest to where the North Raleigh Hilton now stands, though it is still significantly north of the hotel. The Department of Cultural Resources claims the tavern was razed for a hotel. Could the hotel in question not be the North Raleigh Hilton, but what is now the Homestead Studio Suites? That’s unlikely, as the Homestead Suites was built in 1999. Also, take a look at the circular driveway: it seems to go right under the roof on the northern end, making that part more of a carport. 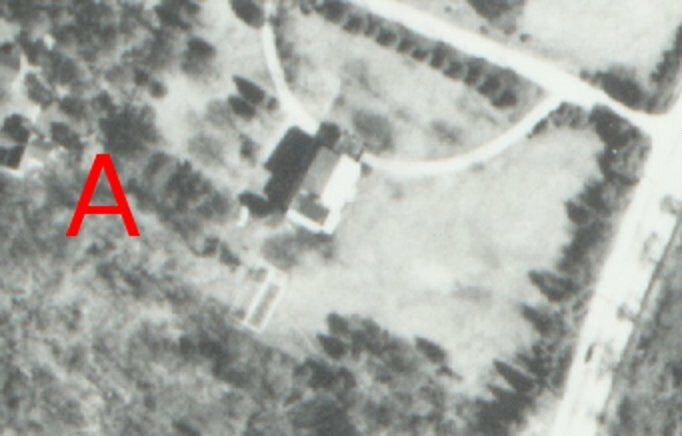 None of the Flickr photos from the State Archives seem to show a driveway anywhere near the tavern. Indeed, the Flickr photos show the building in the middle of an unkempt field. So I think Building A is safely ruled out. Building B seems far more promising. It’s roofline is less prominent than Building A’s, which seems to better match the Flickr photos. It’s in a modest field with vegetation around it that is similar to the Flickr photos. The biggest problem with Building B is that it’s not in a spot where a hotel was later built. But … Building B is almost perfectly positioned near the historical marker! Could it be that the Department of Cultural Resources is wrong about the hotel? It seems that DCR has to be wrong, as none of the buildings that used to occupy the hotel’s location are even remotely candidates for being Isaac Hunter’s Tavern. On the other hand, Building A stood on the spot where the hospital now stands. The hospital, you see, was built in 1974: coinciding very closely with the demise of our tavern. One key photograph in the set is this one. Though the tavern isn’t shown it supposedly shows where it stood. I have my doubts about this because this photo is dated 1969 and other shots of the tavern are dated 1970. One thing that’s significant about this photo is the double-stacked power lines visible through the trees near the horizon. This likely shows Wake Forest Road, which means the photographer is either facing west or east. I’m guessing he’s facing west and the morning sun is behind him, which places the property on the eastern side of Wake Forest Road. I could be wrong, however. Then again, this shot seems to indicate a north-south orientation, judging by the sun’s angle. It might be possible to contact the photographer, Charles Clark, and get the scoop. Take a look at the photos for yourselves. Am I missing anything? See any other likely candidates in the photo? Drop me a comment if you do and let’s explore! Actually, I think the building is in the upper left-hand corner of the aerial photo, you can see the shadow has the right shape for the a-frame roof, it is surrounded by low trees, and this link: http://books.google.com/books?id=ZnJpHZCIlswC&pg=PA200&lpg=PA200&dq=isaac+hunter‘s+tavern&source=web&ots=uvDvjjG1Fn&sig=HwMjTMk4OZLMlPjUtBGtfNzQJfQ#v=onepage&q=isaac%20hunter’s%20tavern&f=false indicates that the building was moved to a field behind a house with a looping driveway. It is also in approximately the same location as Hyatt Place Raleigh North, which though it was built much later, may well have replaced an earlier hotel. Thanks, Bob. Yes, it could be another building. And thanks for mentioning that the building moved. That’s important information. I will post a separate image of more of the northern end of Wake Forest Road so those buildings can be further studied. We, the curators of the Joel Lane Museum House, are fascinated with your speculations about the original location of Isaac Hunter’s Tavern. Since the Capital City was founded on Joel Lane’s property, we often refer to Hunter’s Tavern in our interpretation and would certainly like to know more about it. You might want to contact the NC State Historic Preservation Office, tel: 919-807-7286. Please post your findings–we are looking forward to more information. And thank you for the nice photo of the Joel Lane Museum House you recently posted on Wikimedia. Thanks for visiting, Joel Lane House! 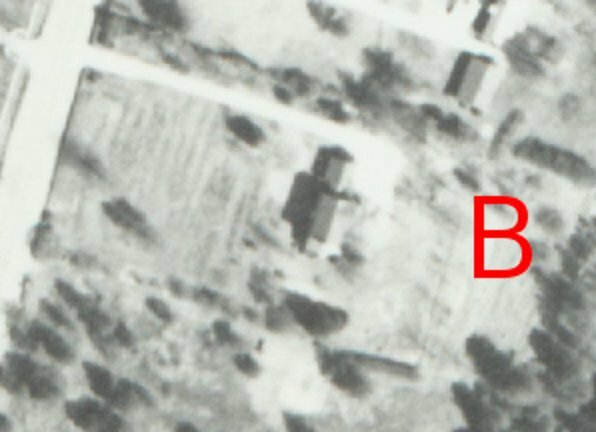 Last night I became convinced of the tavern’s original location and solved the apparent discrepancy between the photos Charles Clark and those of Stu Schwartz. I will post an update to my blog tonight.